A Joy-Filled Day with Princess Jubilee – Happy. Homeschooling. Housewife. Lately it has been a rare thing to spend an entire day with just one little princess. This morning I decided to stay home and spend some quality time with Princess Jubilee. I can’t remember the last time the two of us just hung out together without any pre- planned activities. How freeing it felt to literally go where her interest took us. After Khari and the two older girls left, we headed into the kitchen for her favorite oatmeal mango blueberry smoothie. After smoothie drinking we got dressed and took a long walk around our neighborhood. I was flooded with memories of having to push her around the block this time last year, and now she is running full speed ahead. My how time flies. Princess Jubilee with her first treasure of the day! 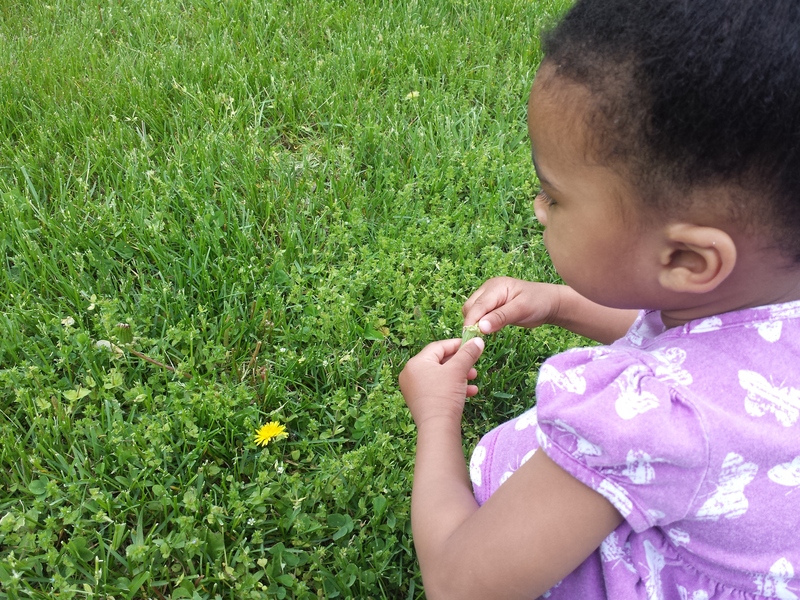 It was such a joy to witness her marvel at the world around her. And I found myself getting down on her level and looking at the world from her ‘right-now’ perspective, and I was humbled. We spent a good ten minutes just admiring this spot of grass! 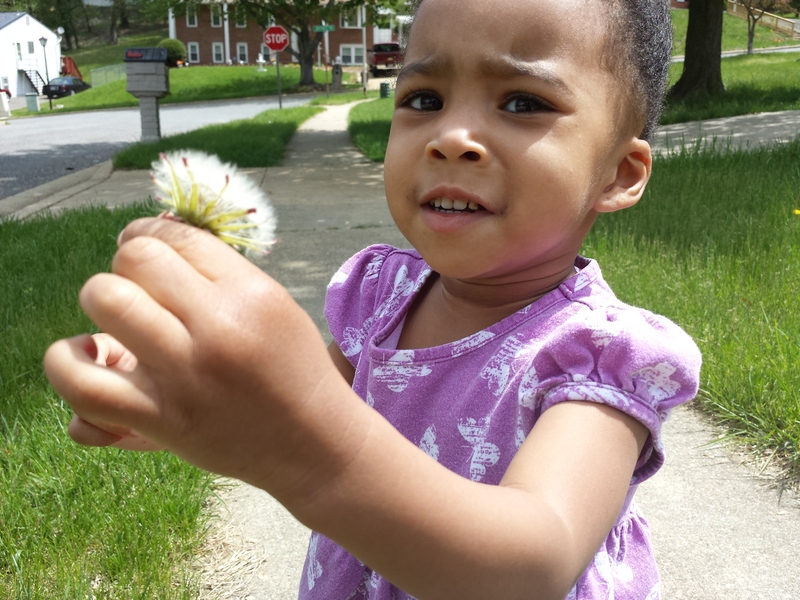 We held hands and sung her favorite song, “Twinkle Twinkle Little Star'”, and picked lots of dandelions. And of course, we fed, walked, and watered her baby along the way. We had to sit down. 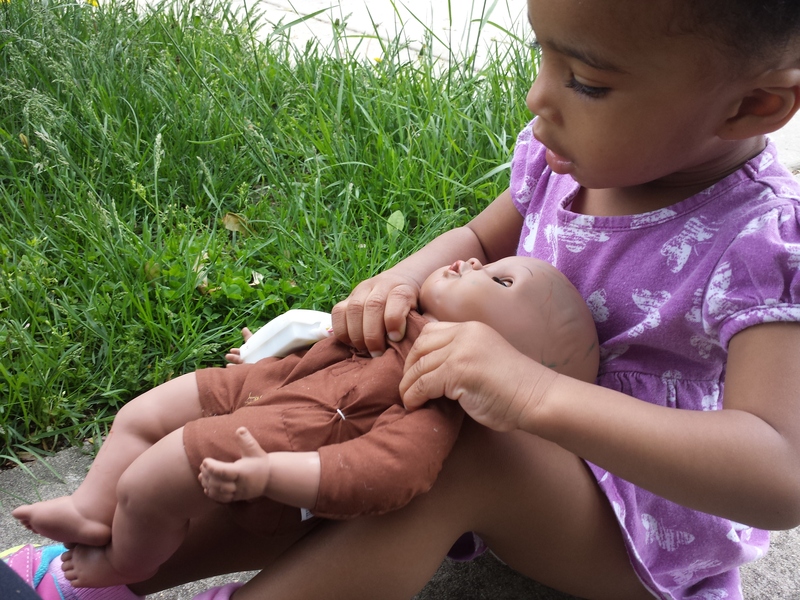 She said, “Sit mommy, baby needs eat-eat.” What a good little mommy! 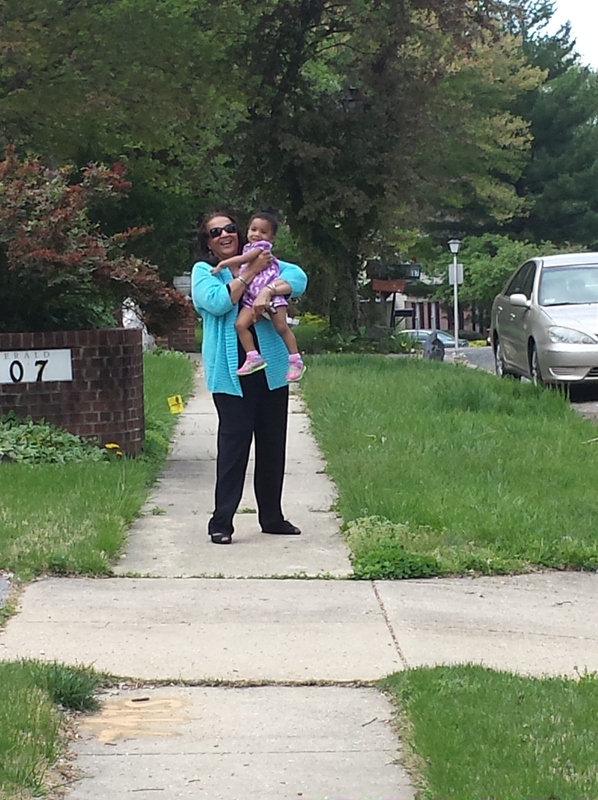 On the way home we got an extra-special surprise seeing Momma (what she affectionately calls my mother) outside of the house. She got the biggest and brightest smile across her face as she raced towards my mother. What a heart-melting moment. She made it to Momma! After lunch and tons of hugs and kisses from her Momma, she took a nap and then woke up to help with dinner. 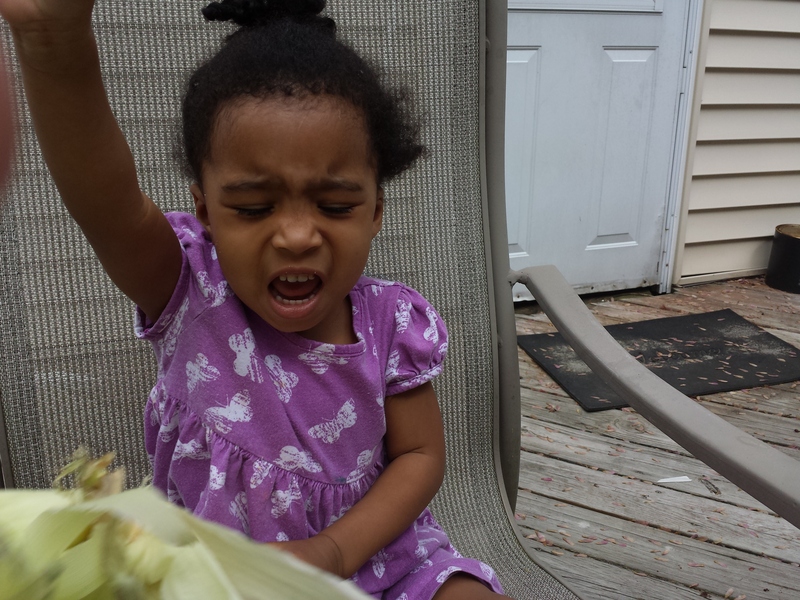 I laughed so hard watching her shuck corn for the first time. I was more like battling corn. When she saw the yellow kernels peak through she would gasp with excitement. Don’t worry, she was victorious! At the end of it all, I am left with gratitude. I am so thankful that I had this day and this special time with her. I am so thankful that I stepped over the piles of laundry (they will be there tomorrow), and pushed aside the piles of books (I can plan later) and turned off my ringer, and simple focused on being present in the moment with my little one. The one-on-one time spent was pure medicine for both our souls! Thanks for reaching out! So for starters, if I can blog so can you! I am not tech savvy at all. I use wordpress (just go to wordpress.com) and literally follow the steps to create your own blog. Some blogs do cost money (this one did) but you don’t have to pay to make a blog. Check out my other blog at http://www.offthesoapbox.wordpress.com. That blog is free. So there are pros to buying your site (there is no wordpress at the end) and upgrading the way the site looks because you can do more things with it but a good place to start is the free one. I hope this helps, good luck and most of all have fun!